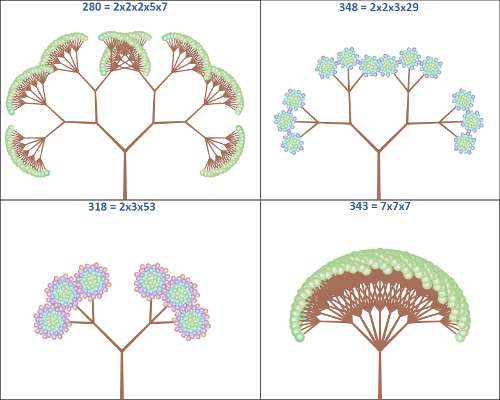 Some time ago I played with the idea of "plant-like" prime factorization visualization, whereas prime decomposition of a number is rendered as a plant, with branching that corresponds to its prime factors. There was a little C++/OpenGL demo producing amusing pictures and all, however one of the obvious problems was that one had to download and compile the code to try it. So I figured I'd give it another shot, from a different angle. It's kind of like Haskell, and Haskell is hard, but these are more like nice pictures and Marios, so I could do those instead and look a little bit like the cool kids who can do Haskell! Now, step by step, about how the code works. 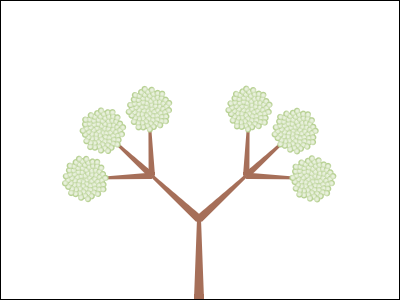 There are two functions "trunk" and "fruit" that create corresponding graphical elements ("Forms"). Trunk is just a polygon (trapezoid), filled with a brown color. Fruit is a circle, filled with a green-ish gradient (specified by an inner center/radius, outer center/radius and two gradient stops). These forms are combined into an "Element" (like a DOM element) using "collage". 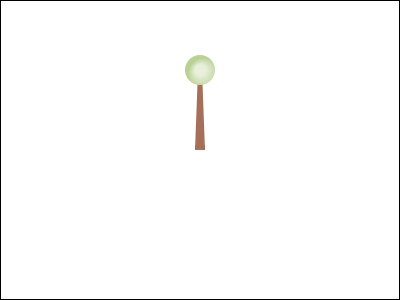 The fruit is moved 80 pixels upwards. Note that the center of coordinates is in the middle of the collage, and Y axis is looking upwards. This collage is what the main program produces and what we see on the screen. Elm borrowed the pipe function ("|>") from F#, and it's used quite a few times in the code to "thread" an argument through several modifier functions. 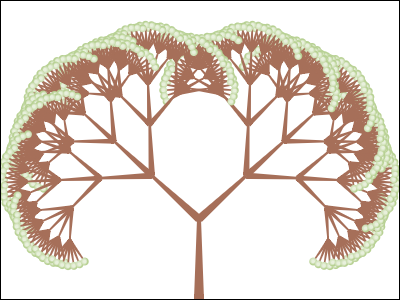 Now let's repeat this trunk/fruit drawing recursively, traversing a list of integers. That's it. In order to understand recursion, one needs to first understand recursion. 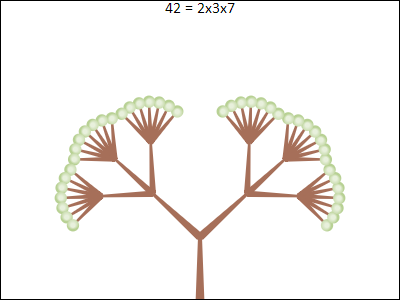 We've got to tackle the situation when a number becomes too big, and drawing it as a fan of branches produces too cluttered image. The solution is to draw it as a "bud" using a Fermat spiral layout. 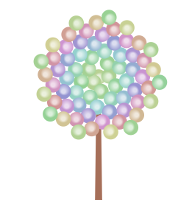 This both gives a nice evenly looking distribution and actually does happen in nature (the so-called phyllotaxis, or an arrangement of leaves in e.g. sunflowers), so it's a good plant metaphor. Now let's step aside from drawing for a moment and look at the "data model" of what we draw. So far we've been producing a static image as the program output. Now, getting to the actual "Functional Reactive Programming" part. This is done via "signals" in Elm - streams of data (such as time and user input) that get transformed, filtered, merged etc. And in the end, the result of the whole program is still in a sense a static image, or rather a sequence of them, built as a function of these signals. The first three signals get merged into a single signal updates via Signal.mergeMany function. A discriminated union Update is used to identify which event in the merged signal belongs to which original signal. Then, this merged signal is threaded through Signal.foldp, which in a sense allows to maintain a current "state", represented by tuple (i, paused), where i is the current number to display, and paused tells whether the animation is currently paused. A couple of other things to mention. One is that the we don't really want to have all these magic numbers in the code, so it's better to have them as named "constants" (which is a kind of oxymoron in our case, since in Elm everything is, you know, "constant"). So there we go: the beauty of mathematics combined with the beauty of functional (reactive) programming. All in your web-browser. 10/10 will try Elm again. Time for some recreational math. would build an approximation of this with a sequence of circular arcs. As a bonus, we would like to generate the corresponding G-codes for these arcs, so the output of our program could be fed to some automatic cutting tool, which would cut out a nice parabola, so we could make a pendant, put it on the neck and proudly wear as a proof of our accomplishments! Given that the problem has real-world practical applications (in 3D printing, machining et al), there has been a wealth of research on the topic. I've taken this ancient thesis as a starting point, mostly because of the simplicity of the approach it is taking. So what we are going to try is essentially a rather brute force, greedy algorithm. Essentially, we will try packing the arcs left-to-right, in a "greedy" way, until the whole segment is covered. Why using Julia programming language in particular?.. This sums it up nicely. 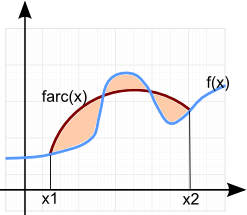 Matlab has established itself as a de-facto standard tool for scientific computations. I've been using it almost daily at the job, and it's rather good at what it does. The first problem is what Octave is trying to solve, by being free and trying to replicate most of the Matlab's functionality. However, it's even "slower" than Matlab, and the language itself is pretty much the same, except of a few improvements (which was their goal, to start with). 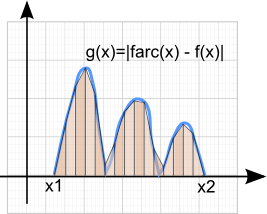 The second problem can be somewhat mitigated in Matlab itself via vectorization (i.e. operate on the level of whole vectors/matrices as opposed to separate elements) or re-implementing performance-critical parts in C/C++. The third one is something that just had to be lived with - Matlab was apparently designed as BASIC for engineers, as simple and straightforward imperative/array programming language as possible. Which is both a benefit and a flaw. Julia is trying to solve the mentioned problems, and some others. At the moment of writing the current stable version is 0.35 (and 0.4 is being in the works), which suggests that there is still a way to go until it can be considered a mature and stable tool. But even now it seems to be doing quite a good job. And unlike Matlab, it's fun to program with, especially using a pimped REPL like IJulia. In fact, this article is just an IJulia notebook, which is available here. So let's go step-by-step and implement the building blocks that we need for the algorithm to run. The basic operation we need first is finding a circle that goes through the three given points. There does noes not seem a corresponding library/function available in Julia yet, so let's roll our own, having looked into the Wikipedia article. But before writing any Julia code let's first figure out how could we test it. As you can see, this one fails. Why?.. Well, simply because 0.1 plus 0.2 is not equal 0.3. Now it passes alright. What if we wanted to compare tuples? There is a bunch of language concepts already packed in a few lines here, such as function overloading/specialization, default parameter values, type inference, iterators, lambdas, tuple splicing, string interpolation, macros and what have you. But this is just a glimpse into the Julia's capabilities, so if it does not make sense to you, then let's just pretend that Julia's test library already has it and move on. Another function we'll need is the one that finds out whether three points are winded counter-clockwise (CW) or clock-wise. We can do that by looking at the sign of the third component of a vector cross product between two vectors spanning our three points. As a bonus we can also determine if all the three points are lined up (i.e they are neither CW nor CCW oriented). Apparently, the part with "any" three points was not quite correct: we can't make an arc through them if they happen to be on the same line. Since the problem constraint was to use only arc primitives (even though in practice G-codes do allow straight line segments as well), we'd need to remedy it somehow. We have field data types specified here explicitly, but generally Julia does not require that. Note that package "Calculus" does have some numerical integration routines, which we could theoretically use, and that's what I tried at first. That did not work out very well, though. 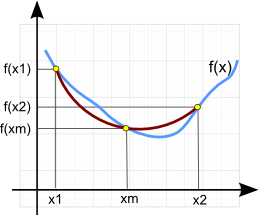 The default integration method (Simpson's) does not seem to converge for some functions. 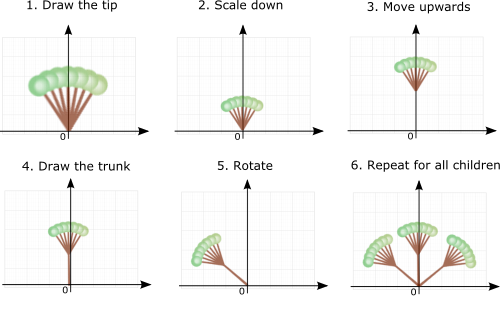 The same test both fails and gives different answers in different runs. Non-deterministic == not good, so let's stick to our own trapezoidal wheel we've just reinvented. 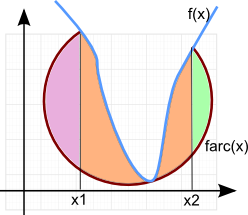 The orange area is the one that we've just computed, but the pink and the green "ears" are the extra pieces that also add to the error value. 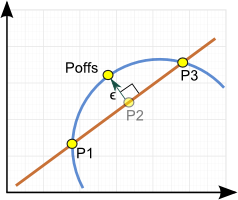 Since we generally take three arbitrary points to draw a circle through, such point configuration is not uncommon, and we need to properly adjust the error metric to account for it. We've left "pick the middle point" as a callback, which by default simply takes the point halfway between the segment ends. We did not write a unit test for this one, since it's a bit too complex of a unit already, but let's try and see how we could test it otherwise. fmt(x::Bool) = x ? "yes" : "no"
It shows us something, but still not much. 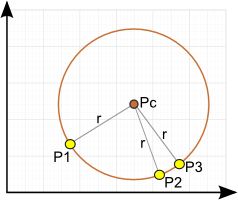 G02 corresponds to the "convex" arcs, G03 to the "concave" ones. 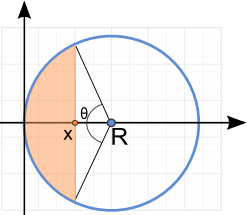 There are two notations for arc codes: IJ-notation (specifying the relative circle center offset) and R-notation (specifying just the circle radius). The latter is more compact, but the former is a bit safer, since it potentially allows the controller to do additional consistency checks. We implement both of them. res = split_lines ? 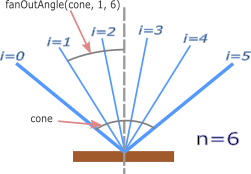 "\n" : ""
res *= (arc.convex ? "G02" : "G03") * " X$(fmt(b)) Y$(fmt(fb)) "
res *= rformat ? "R$(fmt(arc.R))" : "I$(fmt(cx - a)) J$(fmt(cy - fa))"
The actual G-codes appearance can be tested online, for example here. 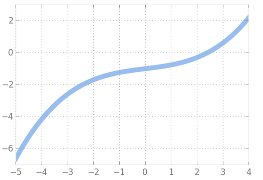 Let's try and plot the arc approximation ourselves, using whatever facilities Julia provides. We'll use PyPlot library, which is essentially a Julia binding to the Python's matplotlib. I initially tried Gadfly, the native Julias plotting library, but even though it looks nice, it's still not even closely come to the matplotlib capabilities. Another gimmick is drawing the actual circles, and doing it in different, palette-based colors. Matplotlib can do that via "circle patches" and "color maps", however PyPlot only exposes a limited subset of the functionality. # add the circles as "circle patches"
We were picking the middle point in a simplistic manner (taking it halfway between the segment ends). The "improved" algorithm is one arc fewer, smaller error, which is better. But it's 25 times slower in this particular case, so it's a matter of accepting the tradeoff or not. The way we've done our arc fitting here is far from being the best possible (it's probably one of the worst! ), but it still gave good enough results. 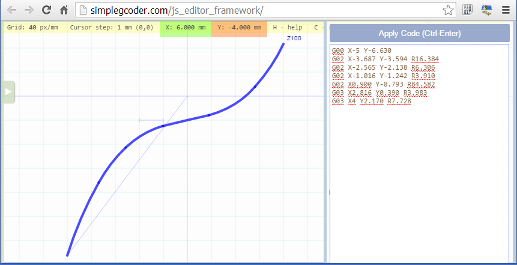 One of the interesting things to try next time is biarc interpolation (a nice description can be seen e.g here). All in all, I've had a lot of joy trying Julia. The code could have certainly been written in a cleaner way, so that's something to improve upon, which I'd gladly try doing. The biggest problem currently is that there is not too much information available on the language itself (Julia books, anyone?..) Another one is lack of a proper debugging facilities. I hope both of these are temporary inconveniences. After all, the language is still young and developing. In any case, Matlab already has a younger sister, who is both beautiful and smart.